The e-commerce market has been growing in recent years. Customers are demanding the delivery of what they want, when they want it. Meeting such needs requires the establishment of efficient delivery systems capable of speedily delivering a wide variety of available products to the customer's door. At MonotaRO Co., Ltd., a company that has made tremendous strides in the same- or next-day shipment of a broad range of product lines and a large number products, Hitachi's automated guided vehicles play a dynamic role in automation and labor-saving at MonotaRO's giant logistics center, from which tens of thousands or more deliveries are made per day. MonotaRO is an e-commerce company that handles the consumables, maintenance tools, and other industrial supplies used in various industries. Logistics centers are a key element in the processing of several tens of thousands or more orders per day and in the making of fast and accurate deliveries to customers. 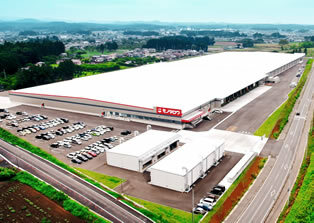 Hitachi participated early on in the building of the Kasama Distribution Center, which is MonotaRO's logistics center for its East Japan territory, located in the city of Kasama in Ibaraki Prefecture. A major issue faced by logistics centers that deal with a wide variety of products is how to increase the efficiency of "picking," which refers to the work of removing products from shelves and sorting them. In general, workers spend over half of their work hours engaged in walking for the purpose of retrieving products. MonotaRO's approach to solving this issue was to adopt a solution proposed by Hitachi, the Racrew, a compact, low-floor, automated guided vehicle. 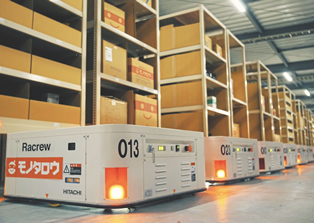 Since 2014, Hitachi has been offering the Racrew as a logistics solution for the manufacturing lines of factories and for delivery centers in the warehousing and online retailing businesses. The Racrew is an automated guided vehicle that travels autonomously in accordance with instructions to position itself under a shelf where parts and products are stored, lift it out, and then transport it to a designated location. Racrew functionality includes the ability to improve transport efficiency by such means as performing analysis and simulations based on data analytics know-how so as to select less-congested transport routes. The use of a distributed system also provides flexibility by enabling one Racrew to take over for another when it is down for some reason. The Kasama Distribution Center has succeeded in reducing the walking distance of workers to nearly zero by having Racrew robots bring the shelves that contain products right to workers, who then can carry out the picking of products without ever having to move themselves. At present, 154 Racrew robots travel about 1,300 kilometers a day, significantly improving the efficiency of picking operations by doubling productivity. The use of Racrew robots is contributing to the establishment of efficient delivery systems that feature such advantages as reduced time from the receipt of orders to shipping. In addition to its hallmark advanced services for distribution centers based on the Racrew, Hitachi is striving for innovation in logistics by working on optimized services for the entire supply chain. Solutions By: Industrial Products Business Unit, Hitachi, Ltd.